After living here for more than a decade I've learned a few things about this place. First and foremost is to never predict the weather. Second is to never make plans without making backup plans. Third, never predict the weather. . .
That said, I'll make a forecast. This fall, 2012 on Glacier National Park's east side (photograph of the Empire builder clipping along the tracks just outside of East Glacier Park, Montana), should be stellar! By all accounts this is shaping up to be one for the record books. We had good moisture, warm summer days, and now the evenings are cold but the days are warm, the perfect combination for fall photography! The unknowns are the weather. At this point the leaf's are already changing but since I cant predict the weather, I cant tell you what's going to happen. Fall colors and fresh snow in Glacier National Park. © Tony Bynum, contact me for licensing. That said, if we stay on this warm day, cool night pattern, in two more weeks the color is going to explode out here! If you're going to plan a trip, just watch the weather. If you see conditions on the east side around East Glacier Park, Babb, or Saint Mary dip much below 20 degrees for a day or two, and it snows more than a few inches, you should plan to hit the west side of the park. Those conditions usually are followed by a strong Chinook wind that will strip the leaves so fast you'd swear the trees never had any in the first place. The sharp ridge in the Crown of the Continent, Glacier National Park, rises above the quickly change colors of the aspen. ©Tony Bynum, contact me for licensing. The outlook is fantastic this year! Plan a trip out here, but make sure you watch the weather and adjust accordingly. If you're coming no matter what, the west side around the North Fork, and the Lake Mcdonald area, along with Highway 2 are always fantastic but usually it ripens a little later than the east. . . Look for more larch than deciduous trees on the west side, and be sure to bring a Tiffen 77mm Circular Polarizer . 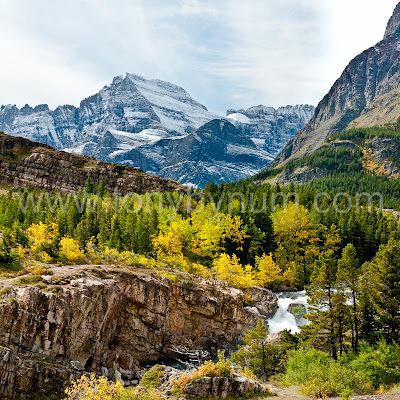 Have a great fall season in Glacier National Park! 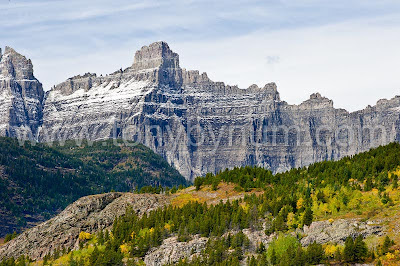 Travelers Rest in East Glacier Park is a fantastic setting and a great place to stay when your in Glacier National Park. ©Tony Bynum, contact me for licensing.